With the knowledge that I have acquired along the way I will now attempt to show how scientifically groundless Dr Clayton's comments are. I acknowledge my amateur status and would welcome correction and comment from any true scientist willing to take an honest look at the case. I have numbered (#) the statement below to relate to my bullet points. The stain JH2 under discussion had no identifiable marks in it to prove that Susan made it. When tested by Prof. Brinkman after the trial in 1995, the stain JH1, that had Susan's fingerprint in, did not even test positive with the KM presumptive test for blood. Click here to view the Table of Results from the Brinkman report. In my opinion, these findings taken together, strongly support the proposition (7) that the blood on the paint flakes (JH2) was human in origin. Imagine our surprise and feelings of devastation to receive this statement from Dr Clayton just three weeks before the last appeal date was due. 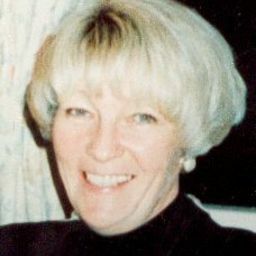 Surprise, because only six weeks earlier in a letter to Susan's solicitor dated the 28 August 2001, Dr Clayton had reaffirmed his commitment to the position held by Prof Brinkman at the time of the actual testing in June 1995, stating regarding JH2, "However, DNA tests were unsuccessful and so no conclusions regarding its possible origin could be drawn". Why was he allowed to change the interpretation of the tests at this late stage? Feelings of devastation, because this statement undermined one of our best pieces of evidence - a bag containing food scraps that tested positive for blood that would have been an innocent source for Susan to have blood on her hands if indeed the stains were blood. We considered delaying the appeal because of this statement by Clayton but it was felt that the CCRC report was so strong that we might manage without this evidence. We will never know if that was the correct decision. One of the unfair things about being innocent and in prison is that it is very difficult to get people to do what you want. Scientists are hard come by on a voluntary basis and neither the defence nor the CCRC have as yet taken it upon them to engage one (other than Brinkman of course in 1995). 1. 'Notwithstanding the presence of 'non-specific ladder bands'. What this means is, "we won't worry about the seven positive readings (circled on the Table of Results) in areas where we expected to have no readings, though we haven't a clue why they are there." This is like a second hand car salesman saying "The body work is in mint condition but don't take any notice of all the rust spots". We would not buy the car neither should we be conned by this report. 2. 'in the extraction negative control'. 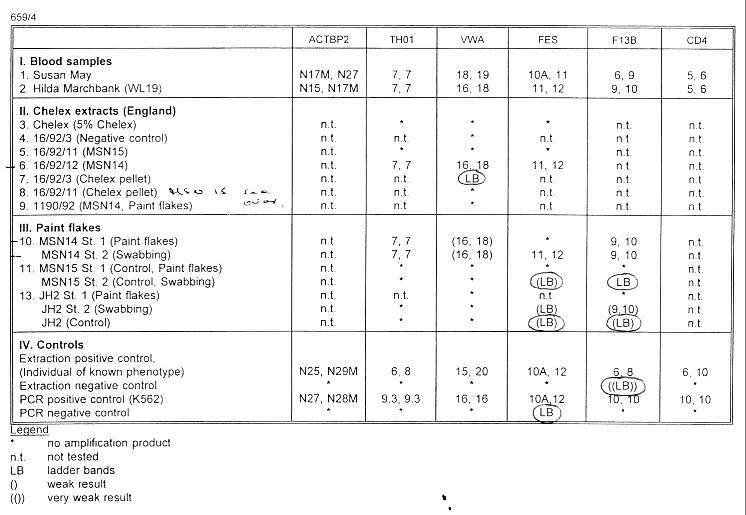 These can be found on Prof Brinkmans Table of Results at 13 JH2 (Control) in columns headed FES and F13B. They both read (LB). A negative control is a test carried out on an unstained sample of the background material on which our stain substance is located. Such a sample is tested to make sure that the background is clean and that if positive results are obtained in our main sample they are not derived from the background. Therefore, it is very surprising that he says that these readings do not matter. As I understand it the presence of any positive readings on the control sample should invalidate the whole test. If these readings are valid it means that the DNA they relate to is on the background material and not in the sample under test at all. What is even more surprising is the origin of the control sample itself as none was take from the wall when JH1 and JH2 were originally removed. I had not known the origin of the control sample used until reading Dr Clayton's statement where, on page four half way down we read, 'An area of unbloodstained paint flake (marked JH2 - control)' etc. This indicates to us that the control sample simply came out of the same envelope that the main sample had been transported in. Being part of the exhibit it had, therefore, every possibility of being contaminated. Without a valid control sample we have no way of knowing that the background itself did not contain some of Hilda's (the murdered lady) DNA. The test is again completely invalidated at this point. Dr Clayton refers to these safety measures at 2.i in his statement. Why does he think they can be disregarded? If Dr Clayton wanted to re-address the interpretation to the results ought he not to have consulted Prof. Brinkman whose expertise had been required to obtain the results? This is especially so when, as he admits in the statement, the F13B locus under scrutiny is not a locus that he is personally familiar with. 4. 'there was a source of human (higher primate) DNA'. If , for arguments sake, we accept that the test is valid (which we do not believe it is) then the reading (9,10) in the F13B column at 13 JH2 St. 2 (Swabbing) on the Table does suggest that this statement is correct. Possibly 'human DNA', note he is not saying it is in blood, is present in this sample. Human DNA is in every cell of our bodies so any human contact left on the wall might be the source (sweat, saliva, nasal mucus, skin, urine etc). No test has been carried out on this stain that has scientifically established that it is blood, let alone human blood or that of the deceased, only a very general presumptive test(see leaflet, 'Prosecution Trial Scientist - Hussain). So Dr Clayton quite correctly holds back from using the term. 5. 'Since a paint flake was chosen which was visibly bloodstained'. We now come to some seriously bad science. In the absence of a valid test for blood Dr Clayton is saying that he can tell simply by looking at the stain that it is blood. Even if it was blood this is not acceptable science. But there is a further problem apparently overlooked by Dr Clayton. This stain has long since been robbed of its natural appearance. Fingerprint enhancement chemicals applied to it have changed its very faint original colour from blue to purple to dark red to purple etc, as well as it having been stored in an unstable environment (Supt Kerr's filing cabinet) leaving nothing of the original colour to be viewed. There is no way that Dr Clayton can determine that the stains are blood simply by looking at them. He is well out of order on this crucial point. Between the original presumptive test and the DNA test specific tests for blood/humanblood are required. 6. 'given that there is no evidence of general contamination'. Well, I do not give him that, even though Prof. Brinkman also agrees, until I have an explanation for the presence of the seven ladder band readings that should not be there on the negative control samples. 7. 'strongly support the proposition'. The presumptive test for blood carried out by the FSS was so weak as to cause them to think that Prof. Brinkman would get no results for this exhibit. The weak result under discussion is on only one out of the six locations open to be tested. When everything else is said to be weak the use of the word 'strongly' is surely out of place. But if the police and the prosecution want it to be so, then the Forensic Science Service will make it so for them as they have in many other areas in this case. How could the judges resist such powerfully worded testimony? I have written to Drs Hussain, Clayton and Prof Brinkman about these matters and have received no response. It is not Susan's position to say that the stains are not blood but simply that whatever they are they were not caused by her in the act of killing her aunt. A fourth stain not mentioned at trial but that tested similar to JH1 and JH2 was found just further along the same wall, it was covered over by some towels and said by a scene of crimes officer to have been there prior to the murder. We would welcome comment from any honest scientists. We have no fear of the truth.